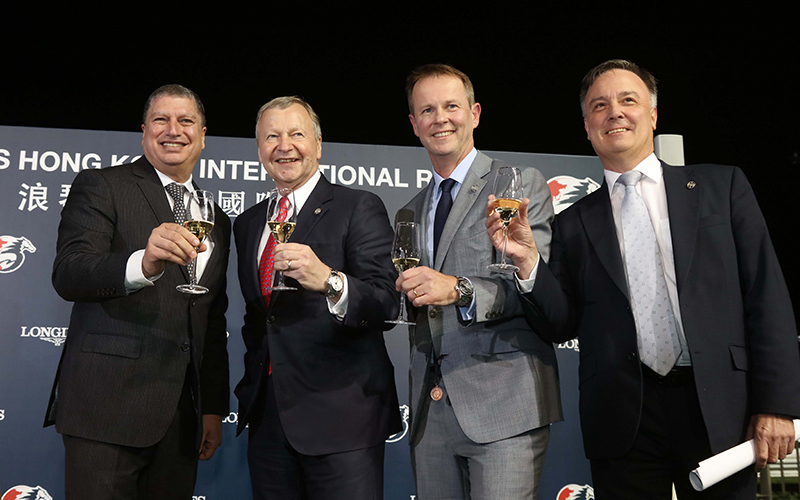 Club CEO Winfried Engelbrecht-Bresges (2nd left) and top executives drink a champagne toast to celebrate another successful LONGINES Hong Kong International Races. Glorious Forever’s victory in the LONGINES Hong Kong Cup wrapped up a first ever Hong Kong clean-sweep at the LONGINES Hong Kong International Races and capped a stellar occasion of world class sport at Sha Tin Racecourse today, Sunday, 9 December, 2018. A vocal crowd of 96,388 enjoyed four stunning races. Beauty Generation was sensational in slamming a top-class field in the LONGINES Hong Kong Mile; Frankie Lor sealed a breakthrough Group 1 with Mr Stunning in the LONGINES Hong Kong Sprint and achieved a remarkable double thanks to Glorious Forever; all after Exultant set the ball rolling with a head-bobbing victory in the G1 LONGINES Hong Kong Vase. The afternoon’s four races carried record purses, being worth a total of HK$93 million, and crowned a week which also featured Silvestre de Sousa’s exciting triumph on Wednesday night at a star-packed LONGINES International Jockeys Championship, as well as Frankie Dettori receiving the LONGINES World’s Best Jockey Award at Friday night’s gala dinner. The LONGINES Hong Kong International Races is established as horse racing’s year-end extravaganza and attracted many world-elite horsemen, with 24 overseas horses competing from Japan, Britain, France, Ireland, Australia and Singapore. The CEO was delighted with the attendance – almost 2,000 up on last year – and was “extremely happy” with the passion shown by those who turned out to cheer their heroes on a chilly afternoon, the coldest of the season so far. The day’s turnover for the afternoon’s 10-race card was HK$1.605 billion, a new record for the day and a slight rise on 2017, while commingling turnover came in at HK$258 million. “This is our highest turnover ever for this day, which is a tremendous result,” he said. “And commingling was a record, too, with a figure of HK$258 million being 30% more than last year. That total does not include more than HK$215 million turnover which was bet in Japan on the four international races, and this all shows that there is a great international interest in Hong Kong racing among customers across the globe. Mr. Engelbrecht-Bresges thanked LONGINES for its partnership, which has been in place since 2012 and has helped raise the event’s profile to a new level. He also commended the Hong Kong Jockey Club staff who organised and staged an event in which Hong Kong can take great pride.